Watch how she’ll transform with Girl Scouts! 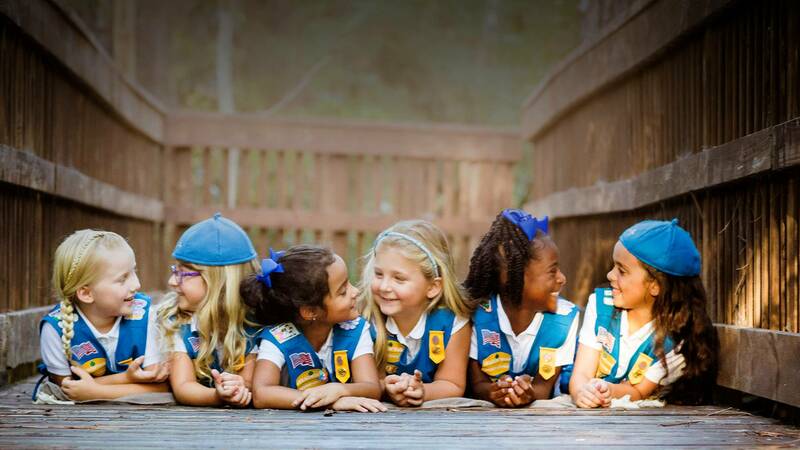 Parents, fill out the form below to learn more about a Girl Scout troop near you! At Girl Scouts, everything she’ll do is designed with, by, and for girls! Whether it’s an outdoor adventure, exploring science and technology, or making the world a better place while having fun with friends, she’s preparing for a lifetime of leadership, adventure, and success. The unique, all-girl environment of a Girl Scout troop delivers a safe space where she can try new things, take on new roles, and just be herself. She’ll be inspired to discover her talents and her passions—and she’ll join with other Girl Scouts, and together they’ll take action to change the world. Along the way, she’ll gain important skills in four areas that form the foundation of the Girl Scout experience: STEM, the Outdoors, Life Skills, and Entrepreneurship. Oh, and did we mention she’ll have the time of her life—and build friendships that last forever? Girl Scouts takes the potential of girls, combines it with robust skill-building programming, and adds caring adult mentors and strong female role models to help girls empower themselves to do great things. Girl Scouts is proven to help girls thrive in five key areas, including a strong sense of self, challenge seeking, and problem solving. Based on time-tested methods and research-backed programming, Girl Scouts prepares every girl to take the lead—in her life and in the world. Give your girl the Girl Scout advantage—JOIN TODAY! Girl-led, expert-approved, and volunteer-supported, Girl Scouts helps girls discover their strengths and change the world.